Luxury Experience Magazine met award-winning Executive Chinese Chef Ip Chi Cheung of the Kowloon Shangri-La in Hong Kong at the 15th St. Moritz Gourmet Festival in Switzerland in January 2008 where he was one of the featured chefs. Chef Ip Chi Cheung has an impressive career beginning with his apprenticeship at age 14, and continuing when he went to work for the distinguished head chef Mr. Lee Keung of Fook Lam Moon Restaurant, who said that Chef Ip Chi Cheung "was not only one of the best chefs in Hong Kong, but also one of the best Chinese chefs in the world;" high praise indeed for this most talented chef. Since that time, both chefs joined Shangri-La, where their careers have continued to flourish. I enjoyed meeting Chef Ip Chi Cheung at the St. Moritz Gourmet Festival where he was obviously in his element, as he loves to create recipes, which he artistically presents. He graciously shares his recipes for a tantalizing four-course menu. Method: Stir-fry the finely chopped onion and dried shallots, put aside. Heat some oil in a wok. Reheat the stir-fried onion and shallots. Mix in crabmeat and seasoning, and stir-fry. Add in fresh milk, put aside. Stuff the shell with the mixed onion, shallots and crabmeat. 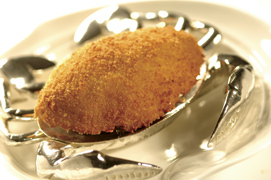 Brush egg over the crab shell, and toss in breadcrumbs. Repeat. Plunge the shell into a wok of boiling oil. Deep-fry the shell to a golden brown color. Drain well and serve. Alternative Shrimp Paste Method: Defrost frozen shrimps (120 grams). Remove shells. Remove excess moisture from the shrimps with kitchen towel. Mince the shrimps with the back of knife. Stir in salt and cornstarch until the mixture turns to a sticky shrimp paste. Sliced Abalone Rolled with Asparagus and Minced Shrimp Method: Cook the asparagus in chicken stock with seasoning for 2 minutes, put aside. 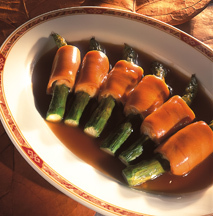 Place the shrimp paste on sliced abalone and roll it up with asparagus inside. Steam the rolls for 5 minutes, put aside. In a wok mix chicken stock with oyster sauce to make the sauce. Dish up the rolls and pour the sauce over them. Method: Steam the black sticky rice grains and white rice grains separately, put aside. Toss the assorted mushrooms in hot oil, add supreme stock and cook until mushrooms are tender; season to taste and put aside. Soak the wolfberries in boiling water until tender. Fry the black sticky rice, add diced mushrooms and wolfberries; season to taste, and put aside. Poach the diced vegetables slightly in boiling water, and put aside. Fry the egg white in a wok, and put aside. Fry the white rice grains, add in crabmeat and diced vegetables, and cook until rice grains are dry. Add egg white and spring onion. 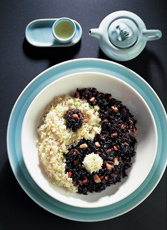 Arrange on serving dish so that black rice is on one side, and white on the other, similar to a Yin and Yang (Tai-Chi) symbol. The inspiration behind the dish: The presentation of the dish resembles a Yin and Yang or Tai-Chi symbol which represents the harmony of dynamic opposites in our world of constant change. In Chinese culture, the principles of Yin (cold) and Yang (hot) are commonly adhered to in everyday life, for example through martial arts, feng shui, the Chinese almanac and the maintenance of harmony in relationships. The principle of Yin and Yang is an important concept in the development of Chinese medicine, believed to be virtuous in maintaining health and enhancing longevity. The ingredients of this innovative creation of Chef Ip are carefully chosen to ensure they are representative of the harmony of Yin and Yang, thus balance health benefit, color, and texture. For instance, it is believed that wolfberries are good for the eyes and help clear vision, black sticky rice has a high fibre content and promotes blood circulation, crabmeat is rich in protein, and mushrooms abound in amino acids which boost energy. This creation is an adaptation of a famous dish of the Mun Hon Banquet, which was made with black sticky rice - a favourite of emperors that was often served in imperial meals. To respect the principles of Yin and Yang Chef Ip adds the white rice grain, opposite in texture as well as color to the dish. Chef Ip highly recommends mixing the two kinds of rice together when serving. Not only will this gesture consummate the concept of Yin and Yang, but also balance the individual flavours and complete the dining experience. 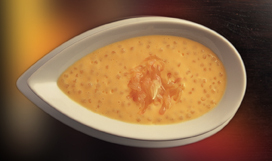 Method: Refrigerate all the ingredients except sago prior to cooking. Cook sago in a pot of boiling water for about 5-7 minutes till sago turns transparent. Pour the cooked sago into a sieve and then place it under running tap water to rid off its stickiness. Drain well in a fine sieve. Combine mango and mango ice cream into a blender to blend. Then, add in sago and UHT whipping cream. Blend well. Add syrup to taste. Pour into individual bowls and chill well in the refrigerator. Garnish with pomelo sacs before serving.